SCHOOL’S OUT… TAKE THE KIDS OUT! The Canteen sits in the converted bike shed of the old Rochelle School, looking out to the trees of Arnold Circus beyond, with outside tables for lovely days. Secluded from the hustle and bustle of Shoreditch, this sun trap is perfect for a post-amble with older kids. The lunchtime menu boasts seasonal dishes including a refreshing gazpacho, tomato panzanella, whole bream with fennel and kohlrabi and a sun-kissed apricot gallette & Jersey cream – divine decadence. With panoramic views overlooking the Thames and a backdrop of London’s sleek skyline, Gordon Ramsay’s The Narrow restaurant is a handsome retreat from the city, within the city. Kids up to the age of 12 can tuck into Tilly Ramsay’s ‘Tilly’s Treats Menu’ for free all day, every day. 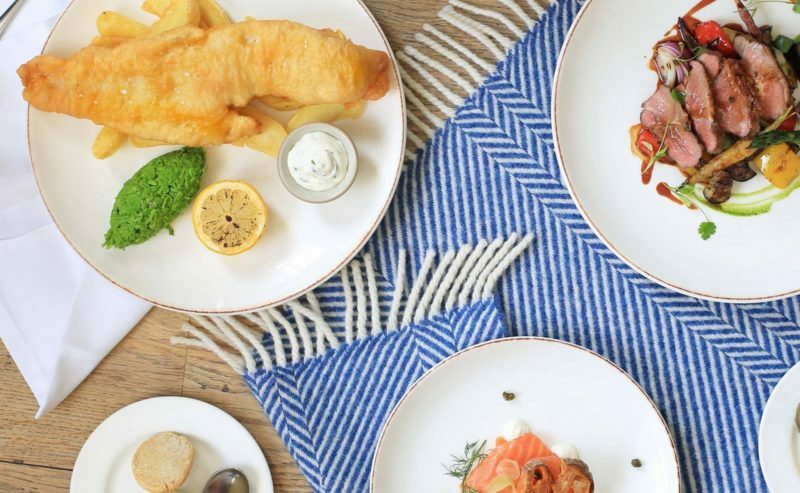 Whether they choose to feast on Tilly’s slam dunk meatballs and pasta or a cracking quintessentially British fish and chips, the food doesn’t disappoint. There’s a sinfully good sticky toffee pud and Tilly’s Treats Kids Pack for craft loving little ones. If a cuppa and light bite amongst the bougainvillea is the order of the day why not treat the kids to a charming afternoon at Petersham Nurseries Teahouse. With dishes inspired by the kitchen garden and a nod to British and Italian cuisine, the menu offers up everything from a cracking Montgomery’s cheddar quiche with garden salad to gluten free chocolate brownies and the lightest of light lemon and poppy see cakes. Seasonal fruit, dairy, egg-free and veggie options ensure that this menu is fit for all families. This Thameside stalwart is a summertime joy. Nab a seat in the glorious riverside garden, planted out with endless herbs, salad and edible flowers, and you can your family can feast on the best Italian food this side of Florence. Primi plates of ravioli stuffed with buffalo ricotta, garden herbs & lemon zest and taglierini with cherry & marigold tomatoes and basil are the perfect size for smaller guests and the dreamy Gelati del River Cafe will set gleeful grins on tots for days – roasted almond and caramel are a winning combination. If you pick the Chocolate Nemesis, be warned – tiny nimble fingers will be a-pinching this stellar dessert!